The European Commission yesterday (22 May) congratulated Portugal and Spain for turning their economies around, just one year after breaching EU fiscal rules, while it gave its blessing to vital adjustment made by Italy’, one of the eurozone’s most troubled members. Economic Affairs commissioner Pierre Moscovici welcomed the positive news in an interview with a group of correspondents including EURACTIV. Looking ahead, he said that a “window of opportunity” had opened in order to finally complete the desired economic and monetary union. 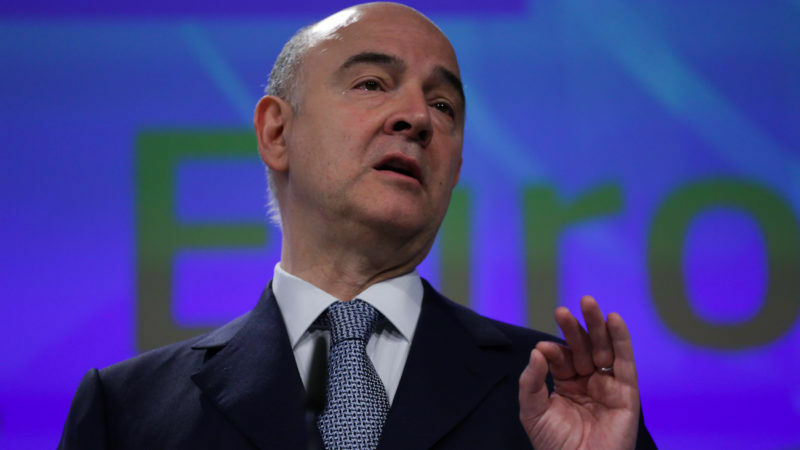 Pierre Moscovici is commissioner for Economic and Financial Affairs. He was the minister of Finance in France under Francois Hollande (2012-2014). How important is it for the Commission to have Portugal out of the excessive deficit procedure? It is a very important day for Portugal, for the Portuguese people and the Portuguese economy. Since 2009, Portugal has been under the excessive deficit procedure and had seen a programme of adjustment with extremely painful social consequences. So after nine years, we are now able to end this procedure. Why now? Because the Portuguese deficit is sustainable under 3%, it is even sustainable under 2%. It is also an extremely reassuring signal for those who are unsure about the credibility of Portugal’s economy and the solidity of its public finances. Things are going a great deal better in Portugal. This is good news for Portugal but it is also good news for the European Commission and the whole of Europe. Some are not convinced by the way the Stability and Growth Pact works, but when you look at the progress we have made from 2011 to 2017, the fact that we have gone from 24 countries in excessive deficit procedures in 2011 to four today, and I hope next year, to zero, this proves that the rules do work. I remember that the average level of eurozone deficits in 2011 was 6% and today it is 1.4%, so the Pact works. At the same time, this pact is not founded on policies that harm growth, because growth is rising in the eurozone, currently at 1.8%, and unprecedented job creation in Portugal. So this is really good news for everyone. About the Caixa Geral de Depósitos, you said that the deficit can remain under 3% even if its recapitalisation has an impact. But exactly what reassurances did you get from the Portuguese government? We have no doubts, we have no suspicions. We see that the budgetary policy of the Portuguese government is a serious policy, and Mario Centeno is implementing it seriously. But of course, there are still questions remaining over the impact of the bank recapitalisation, both this year and in the longer term. We do not have definitive figures, which will be provided by Eurostat. But taking into account our conversations with the Portuguese authorities, we believe this recapitalisation will not have a sustained impact above the 3% threshold and that even if there is a little bump in the chart, it will be a one-off. The following year, the Portuguese finances will be healthy and back below the 3% threshold. This is why we decided, unanimously, to end the excessive deficit procedure, based on serious talks with the Portuguese authorities. Did you ask for a compromise with extraordinary measures that can be brought in at a certain moment? No, not at all. Today’s decision is not a conditional decision…it is a firm decision that we will propose to the Council. Does it annoy you that in the debate on Europe, particularly in Italy with leaders such as Matteo Renzi, politicians always talk of a Europe of technocrats or Eurocrats? I don’t know if it annoys me but it does make me smile. I find it really, completely unjustified and in some cases misplaced. If there is one country that cannot think that this Commission is a technocratic Commission it is Italy. It’s the only country that has benefited from all the flexibility offered by the pact, in massive proportions. This flexibility represents far more than €10bn for the year 2016. We granted Italy the structural reform clause. Nobody else had this. Finland will have it this year. We even granted Italy the investment clause in 2016, while in reality, investment had declined that year, but we took into account delays to the delivery of structural funds to Italy. We considered that the budgetary measures in place for 2017 were sufficient, overall, to fulfil the requirements of the pact. So, frankly, anyone who accuses the Commission of being a fussy and restrictive guardian of the rules is not serious. The Commission plays its role. We believe Italy is a central and crucial country in the eurozone, a country whose efforts at reform need a helping hand, a country that needs to be understood by the Commission, with intelligence and sensitivity. I think we have made decisions, within the framework of the rules, of course, which have been marked by a good political will that should be recognised. And I would like the Italian political debate to stop taking aim at the Commission, while the Commission has been a vigilant, demanding and serious friend to Italy. The dialogue we have with the Italian government is particularly intense and friendly. Not a single week passes without me speaking to or meeting [Finance minister] Pier Carlo Padoan. All this has led to real progress. But let’s be serious, if the Commission is Italy’s enemy I don’t know who its friends could be. We are great friends of Italy. Personally, I consider myself to be a great friend of Italy. All I ask is that we are given the credit we deserve. So does Italy receive favourable treatment? Nobody is treated more favourably than anyone else. I do not want to give the impression that this is benevolence and that we are breaking the rules: we are not. We have always applied the rules, using the flexibility they provide. This Commission is serious about budgetary control but we act with sensitivity and intelligence and political reason. Let’s not beat around the bush. but that is because it is the country with the weakest growth that had the biggest need for flexibility. We just took into account the situation of the country. So no, there is no distinction between the big and the small, there is no favouritism for Italy over the others. We try to be fair. But it is true that we find ourselves blamed for all the evils in the world in the Italian press, despite the fact that we have done everything within our power, no more and no less, to find solutions for Italy. I just ask for that to be recognised. This, for me, would be the most basic political justice. In order to implement reforms, you need political stability. With the election of Pedro Sanchez as the new Socialist leader do you think political stability in Spain is at risk and might reforms be affected? We are never concerned about the internal political evolutions in the member states, as long as the populists are not winning. Neither will we comment on the internal life of the European political parties. What is happening inside the PSOE concerns Spain, and the question of political stability in Spain is the business of the Spanish government and Spanish political parties. With France’s new leadership, do you see the space opening up for a new political dynamic in Europe? Emmanuel Macron took office eight days ago, but already he has confirmed a strong European will. Along with the German chancellor and the Italian prime minister, he has already taken on the task of deepening and further integrating the eurozone, which the Commission has promoted. And on a personal level, I am very happy about this because for years I have been proposing a eurozone finance minister, a eurozone budget and a eurozone parliament. And the fact that there is a French-German working group, the fact that there was a meeting between Paolo Gentiloni and Emmanuel Macron this weekend, the fact that the objective is to reduce divergences within the eurozone, this is all going in the right direction. And this is all in line with our reflection paper, which is there to offer precise and strong proposals for the eurozone. So yes, a window of opportunity has certainly opened. That does not mean that everything will be achieved in one day or that our visions will come together straight away. We know this will not happen. But now we know that there is a desire to move towards a more integrated, stronger eurozone that creates more jobs and growth. The European Commission, and I in particular, will dedicate all our political energy to this aim. The European Commission announced on Monday that Portugal will no longer be under an excessive deficit procedure. After receiving a €78 billion bailout in 2011, the turnaround came after the executive concluded that the economy would achieve a deficit of 2% of GDP, well below the EU's threshold of 3%. Italy also received positive news as the Commission said that Rome does not have to adopt new measures to reduce its mastodontic public debt of 133% of GDP. The institution gave a positive verdict to the additional fiscal measures adopted this year. The Commission granted Lithuania and Finland with the requested flexibility in order to meet their deficit targets. Meanwhile, the executive sent a warning to Romania as it found that there is a "significant deviation" from the agreed fiscal path in order to balance its public accounts. The Commission proposed that the country adopts new measures to correct the deviation detected. Following years of booming deficits, warnings, austerity measures and, more recently, an accommodative stance from the Commission's side, all countries comply with the fiscal rules except France, Spain, UK and Greece. France is the only country of the group that still has excessive macroeconomic imbalances. Only a fiscal and Budgetary Union is a real progress .